It is more important than ever for Bible-believing Christian churches to take a stand for the truth. When compromise sets in, it begins a domino effect that leads to further compromise and even to unbelief. Liberal churches and atheists are attacking us at our foundations, which begin at Genesis. Further, they appeal to emotion with loaded terminology and the false dichotomy that people must choose either faith or "science". This is a lie. (I have written before that even if we gave up the creation accounts, that would not be enough for liberals and atheists.) The church is in serious trouble, and people's faith is threatened because they do not see the relevance of their foundations, and do not bother to discover that there are indeed answers to those science philosophy questions. 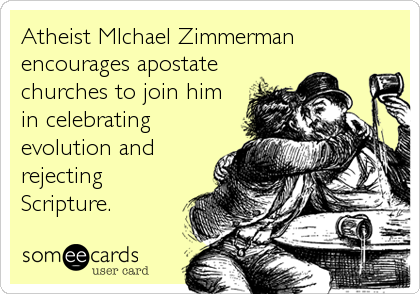 This weekend, atheist Dr. Michael Zimmerman is once again encouraging churches to preach Darwin from their pulpits. He claims that his Clergy Letter Project, signed by over 12,000 members of predominantly liberal clergy, shows that evolution and Christianity are compatible so long as we define religious truth as dealing with doctrine and morality and scientific truth as dealing with facts. The problem with his entire Letter is that it relies on the fallacy of the fact/value distinction. Jesus asked Nicodemus in John 3:12: If I tell you of earthly things and you don’t believe, how will you believe if I tell you of heavenly things?” Christianity doesn’t just make claims in a vacuum. Our doctrines, principles and moral claims are connected to historical facts. For example, our doctrines of salvation and future resurrection are based on the notion that Jesus Christ was historically and physically crucified, buried and resurrected by God as prophesied by Scripture. You cannot divorce the two. The doctrine of marriage as being between one man and one woman finds its foundation in Genesis 1 and 2, which Jesus quoted in regard to marriage. So we cannot copartmentalize our faith and our science. Neither can we accept the all-natural assertions of science over the supernatural revelation of God’s Word, because if we get consistent in this policy of letting science chained to pure naturalism trump the revelation of Scripture, we will find ourselves with a curious book of stories that no one really believes, for all-natural science denies that men rise from the dead, that virgins conceive, that the weather can be controlled at a spoken command, etc. In reality, all that science chained to pure naturalism can do is to provide all-natural answers which may or may not be true and are certainly false where supernatural agency was involved. It has no way to determine whether God did anything, since supernatural agency is ruled out as a possible answer from the outset… but it pretends that any all-natural answer they come up with negates the possibility that God did it instead. I strongly encourage you to read the rest of "On the Compatibility of Christian Faith & Evolution: Which Atheist is Lying To Us?"